I solicited nearly a dozen of my most well-traveled friends for dining suggestions in Savannah. Without exception, every one of them – including a friend who forwarded me a fairly long list – told me I’d find very little there worth the effort. Go to Charleston instead, they urged. But I had already been to Charleston – twice in the last year, in fact – and never to Savannah, which I heard was incredibly charming, full of parks and history. I like parks. I love history. Why shouldn’t I try a change of scenery? And, being from a city that is always underestimated, especially by foreigners, I was confident I would find some gems once I got on the ground, among the locals. Standing on line for lunch at Mrs. Wilkes’ Boarding House, I noticed the woman in front of me wrestling with her map and guide book. She was visiting from Atlanta. Having sent her two boys off to buy a memory card for her camera (so she could take pictures of her lunch), she was taking a moment to triangulate dinner. Since my friend and I were undecided about our own dinner plans, I struck up a conversation. The problem, she told me, is that no one she knew had any solid recommendations. The only restaurants in Savannah that anyone seemed to know about were Mrs. Wilkes’ Boarding House and Paula Deen’s restaurant, Lady & Sons. Overhearing us, the man behind me joined in. Based on the way he pronounced “Flahrida,” where he lives now, I knew he was from Queens. He drives (drives!!) between the two every other week and often stops in Savannah for a meal, as he was doing that day. When we asked him if he had found anything worth recommending, he shook his head. He told us that he prefers to stop in Charleston, because the restaurant scene there is so much more diverse, and the food is better. Neither the staff nor the other strangers around our table at Mrs. Wilkes’ Boarding House could come up with any more-promising dinner suggestions. Maybe all of my friends were right: currently, Savannah simply isn’t a place to visit if you’re looking for variety and quality in dining. We got out of Mrs. Wilkes’ Boarding House late that afternoon. While my friend went off in search of a haircut, I broke off for a little walk with my camera. By chance, I happened upon Lady & Sons. Curious, I went in for a look. I was greeted by a very young face, and beyond him, a steaming buffet line. Although the restaurant is quite fetching from the street, a dusty-brick edifice, the interior is shockingly plain, a sea of naked, wooden tables and chairs, boxed in by white walls painted with ivy. At four o’clock in the afternoon, it was pretty empty. When I inquired about dinner reservations, the kid told me to check with the reservationist outside. Apparently, the lines get so long that have to redirect non-dining traffic to the sidewalk. Me: Do you have any reservations left for tonight? There will only be two of us. She: What time would you like to eat? Me: I’d prefer something on the later side. Me: I was thinking more like nine o’clock. Me: Are you open that late? She: We’re open. But you’ll be the only people eating at that time. Me: I’m okay with it, if you are. She took down my information, and I went on my way. 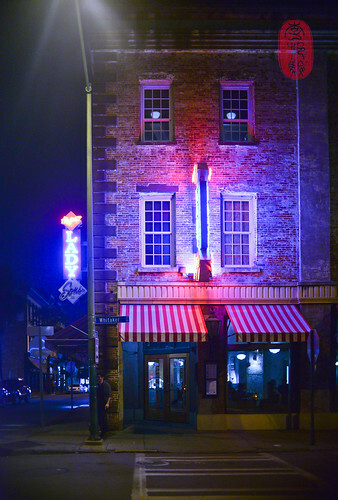 Now, I know that Lady & Sons is not the type of restaurant that normally appears on this blog. A couple of my friends actually tried to dissuade me from writing about it. There are far more important restaurants that I could be writing about, they insisted. Let’s side-step the hysteria over the butter and diabetes for a moment and work through this calmly, as I did on my way back to the hotel to tell my friend what I had done. As much as America reels from Ms. Deen’s fried, fried, and fried-again approach to cooking, America also made her famous. You or I may not have ever watched her show, or thought that her recipes were sensible in any century. But clearly, there are enough Americans who do. Likewise, you or I may not frequent corporate chain restaurants – you know, the ones that hand out vibrating pagers for two-hour waiting lists. But, despite our finger-wagging at their over-sized portions and use of commodity products, if we are to be truly honest about the food they serve, we’d have to admit – it’s really not that bad. Most of it’s well-made, and, more importantly, consistent. That’s why there’s a two-hour wait to get into those factories. So, surely, Ms. Deen did not become the fourth highest-paid chef in the world last year by making bad food. Right? Well, I don’t know, because it seems to me that Paula Deen became famous, primarily, for being a sensationalist. She had an inspiring story to tell about a single-mother of two boys, who cooked her way out of both poverty and agoraphobia to become one of the most successful food personalities in our country. And America ate it up. But what, exactly, did we eat up? Was it her syrupy sweet personality and cross-eyed cackles? Or, was it her food, a high-calorie spectacle that someone I know might describe as “terrible-wonderful“? Or both? Ms. Deen did host an incredibly popular cooking show on the Food Network for years (is it still running? ), and published and sold plenty of magazines and cookbooks too. I can’t believe people would keep watching, or buying her products if her food weren’t any good. So, it was with the confidence I have in the basic principles of capitalism that I went, optimistically, to dinner at Lady & Sons. The reservationist was right. We walked into a fairly empty dining room that Monday night. Instead, I’ll just tell you about how large everything was. We quickly dismissed the buffet for a couple of reasons. First, we saw fried chicken. We had eaten fried chicken that day for lunch, and for brunch the day before. Second, although it seemed like a smashing deal ($17.99, all you care to eat, plus dessert), the amount of food that sat steaming on that buffet line in an empty restaurant didn’t seem appealing at the time. So, we turned to the menu. Of the four dishes we had (two appetizers and two main courses), the plate of fried green tomatoes ($7.99; “A Lady & Sons must do!”) was the best, partly because it was the most straightforward dish we ordered. The tomato slices wore a wrinkly, batter crust that looked a lot like fried chicken skin and was just as crisp. They needed a bit of salt, but borrowed flavor from the red pepper sauce and vidalia onion relish that came with them. My capitalist optimism quickly unraveled in the remaining three dishes, all of which included an unexpected twist that was probably meant to be exciting, but ended up being confusing. I am not prone to hyperbole, but “Paula’s favorite” Cornucopia Salad ($9.99), an appetizer, could easily have fed two as a main course. The bed of mixed (romaine and iceberg) lettuce came mounded with tomatoes, cucumbers, mushrooms, carrots, green peppers, red onion, cheese, walnuts, raisins, hard-boiled eggs, croutons, and – I had to read this twice – bananas. Thankfully, I had asked for the poppyseed dressing on the side. Perched on the rim of the bowl were four ramekins of it, which seemed excessive until I realized that the surface area of the lettuce in the salad alone probably demanded that amount for a proper coating. Looking past its size for a moment (and let’s ignore the bananas too, which I don’t think I’ll ever be able to explain), the salad was unnervingly sweet (carrots, raisins, bananas, and poppyseed dressing will do that to a salad, I guess), but otherwise unremarkable. It seemed like I was eating it for days. The New York strip steak, a special of the day (somewhere in the neighborhood of $28), came coated in creamy Parmesan sauce next an enormous pile of mashed potatoes. The steak was alright, but the mashed potatoes were pretty bad – sort of cold, and all-around uninteresting. There were also three wheels of grilled eggplant, which, I suppose, weren’t completely out of place. But they hadn’t been properly lubricated or seasoned. Of all things you should lubricate and season, it’s eggplant, especially when you’re grilling it. They were like styrofoam. The “Savannah Crab Cakes” ($23.99, and a “New York Times favorite!”) were big and thick (but not as big and thick as the sea of rice and beans that came with them). The cakes were mushy and moist, composed mostly of what seemed like backfin meat (not lump meat, as the menu claimed) and filler. If we are willing to accept the fact that it was okay for Ms. Deen to give these “Savannah Crab Cakes” a Mexican treatment (in addition to rice and beans, there was also pico de gallo), that would leave only one mystery to solve: why were the crab cakes coated in shredded cheese? Having melted, the cheese left a plasticky crust, making them impossible to cut through without the soft filling oozing out the sides. Maybe I’m over-thinking this, but was she trying to make crab frico? Because, this is not the way you do it. I am still willing to believe that Paula Deen is a terrific cook, full of great Southern recipes. Maybe, if I were to return and eat through her menu, I’d find them. But sadly, on this visit, I did not. Instead, what I got was a bit of a circus, contrived and somewhat confusing. Despite being deeply rooted in tradition, Southern cuisine can, of course, be made new and shiny. There are chefs all over the South doing it. But, with all due respect, Ms. Deen, you are not one of them. You are supposed to be that happy, Southern neighbor-woman – the one you play on your television show – who cooks good, simple, and familiar Southern food that makes people happy. 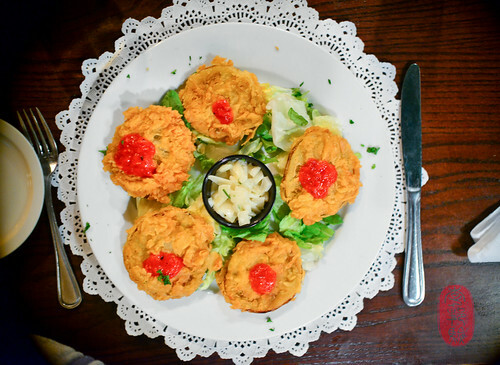 Why are your “Savannah Crab Cakes” some strange form of Mexican frico? Why are you putting bananas in your salad, with mushrooms, green peppers and hard-boiled eggs? Is that really what you cook at home? Maybe I have misconceptions about what it is you do. Or, are these just accessories to your sensationalist success? Against my greatest hope, Lady & Sons lived up to the prevailing cynicism hanging over Ms. Deen and her brand of cooking. I wish I could have surprised both you and me with a glowing report. But, I cannot. And it makes me sad. Ms. Deen has great employees (service was terrific), and a wonderful story out of which should come some deeply soulful food. I did not get that. Was I foolish for thinking I could? * We went to the Olde Pink House before our dinner at Lady & Sons for a couple of drinks and a fairly dispiriting plate of “Southern sushi“: shrimp and grits rolled in nori, sliced, battered, and fried. It tasted just as bad as it sounds. And, at $8.95 for three, little over-fried nuggets, I found it pretty offensive. ~ by ulterior epicure on December 2, 2012. It is tough to find great eats in Savannah, but there are a few better options than what’s listed. I love that you kept such an open mind the whole time. At least you gave them a shot to prove themselves. You’re brave. Would love to hear about Back in the Day Bakery and Mrs. Wilkes’ Boarding House. We had a great meal at Local 11 Ten Food & Wine.